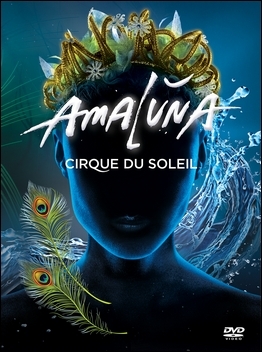 Just as our January 2014 issue “headed to press” last month, I’d received via mail the package I had been waiting over a week for: my copy of the AMALUNA DVD, which had quietly been released to the Cirque du Soleil Online Boutique and on-site under the Grand Chapiteau. To say I was excited to view AMALUNA again would be an understatement; I fell in love with the show at premiere in Montreal. I had such an amazing experience with AMALUNA, if you don’t mind me saying again – more amazing than any touring show premiere that had come before. And I shocked my friends who were there with me too, because I didn’t really like the show the first night. Sure, I enjoyed it and some of its acrobatic elements, but overall Amaluna didn’t “speak” to me, nor seem to hold a candle to some of Cirque’s more sophisticated offerings, such as Quidam, Alegria, Mystere, “O” or ZED. Then something strange and amazing happened: as we assembled for the performance the following afternoon, I grew more and more excited about seeing it again. Then as I sat, allowing the opening moments of the show wash over me, something clicked. I don’t know why and I don’t think I could ever explain it succinctly beyond: I “got” it. I got the show, what it was attempting to say, how the music was used, and all the visionary elements the creators stirred into it. And then I fell in love with the whole kit-and-caboodle, grinning like a slack-jawed idiot. It was uncanny, and welcome. I felt enlightened, invigorated and hungry for more. Naturally I devoured the music CD when it was released, comparing and contrasting the studio version of the show’s tracks to those played live, but what I really wanted was a video recording of the show. Rumors began floating regarding a DVD as soon as the tour left Montreal for Quebec City and Toronto. By December 2012, DVD-like footage turned up – about 50 minutes worth of highlights – on French/German network ARTE (fans might remember that a similar highlight reel of KÀ had aired on the network in years past), further stoking rumors. And as the old axiom “where there’s smoke, there’s fire” told us: surely a DVD release was around the corner. Nice turn of phrase, but, it didn’t apply here. The smoke petered out. News about an imminent release trickled to a halt. Rumors stopped. It turns out that thanks to the filming and subsequent release of Worlds Away 3D to theaters in December 2012 pushed the DVD release of Amaluna back. But now we can finally get our hands on it. So how does the DVD fare against some of Cirque’s more recent home releases? Much like Cirque’s more recent DVD releases (“ZAIA: Crossroads in Macao”, “ZED in Tokyo” and “Cirque du Soleil Presents: Koozå”), the title is presented in the company’s “new” recycled paper packaging, adorned with the show’s poster, and a quick blurb on the back describing the product in hand: “Cirque du Soleil presents Amaluna, the coming-of-age story of Miranda, who meets a brave young suitor named Romeo upon his unexpected arrival to her mysterious island. Miranda and Romeo must endure a series of trials that teach them both about trust, harmony, balance, and inner strength through the art of Cirque du Soleil.” And much like the company’s previous show DVD releases, AMALUNA is also presented as a 2-disc package. But after viewing both discs I’m left scratching my head in wonder: why there was a need for two discs? The “Show Disc” doesn’t really need much in the way of comment. The basic options are available here; the video and audio here is stunning, and the video recording presents 99.9% of the show as you would have seen it in Toronto – currently cut acts and all. This disc is the true gem of the package! An un-cut show! It’s the inclusion of the second disc that confounds me: the “Bonus Disc” doesn’t really contain much on it, and that’s the real perplexing part. Slipping it in you’ll find five (5) menu selections: THE STORY, MUSIC, DIRECTOR, UNVEILING THE NAME, and CASTING – each containing a little peek into the world of Amaluna. And I do mean little. THE STORY – is a 1 min 44 sec video giving us a brief peek into what the story of the show is all about and how it draws from “The Tempest”, using clips and interview style, but there isn’t anything new here. DIRECTOR – a 1 min 44 sec video featuring the show’s Director – Diane Paulus – enlightening us how she came to Cirque du Soleil and why. However, as before, there isn’t anything here of real substance. UNVEILING THE NAME – is a 1 min 2 second video describing the show’s name, the reason it was chosen, and a little passage on the show’s theme in relation to its chosen name. However, this is nothing the blurb on the back of the DVD didn’t already tell us. CASTING – a 1 min 17 sec commercial for the Cirque du Soleil Casting Department. Want to be an acrobat? The music is the truly surprising addition to the “bonus disc”, in my opinion, and I’m forced to ask: with the release of the CD a year prior, why were these even included? The immediate answer could be because the two (the CD and the DVD) were scheduled for release at the same time, and this offered Cirque du Soleil a convenient cross-promotion opportunity. Even with that being true why the second disc at all? If you add up the various video segments you only come to 5 minutes and 47 seconds of added material. Certainly this could have fit on the “Show Disc”, could it not? Add the music tracks there and viola, you’ve got a complete package without the waste of an added disc. Perplexing, isn’t it? Still there’s no reason not to add the title to your collection, especially if you fell in love with Amaluna like I did!